The Kurdish–Turkish conflict is an armed conflict between the Turkish government and various Kurdish militant groups seeking to create an independent Kurdish state that will include a part of Turkey. Results of Russian Military Campaign in Syria: October 21, 2016 – May 24, 2017 4.9166666666667 out of 5 based on 12 ratings. 12 user reviews. While the war in Syria is far from over, the events of October 2016 through May 2017 will likely be described as its turning point that enabled the Syrian-Iranian-Russian alliance to assume strategic offensive and dictate the tempo of operations. In turn, various rebel forces, including Hayat Tahrir al-Sham (formerly Jabhat al-Nusra, the Syrian branch of al-Qaeda) and Ahrar al-Sham are no longer displaying the ability to launch offensive operations capable of yielding major results. On October 28 2016, Jabhat Al Nusra, Ahrar Al Sham and Free Syrian Army groups launched a major attack on Aleppo in order to break the Syrian Arab Army (SAA) siege on the rebel-held part of the city. By October 31, the militants captured the Binyamin industrial zone, half of the Binyamin district and most of the Dahyat al Assad district. When the first assault was blunted, Jabhat al-Nusra and its allies launched the second phase of the attack in western Aleppo on November 3. However, it had failed to break the siege, as the SAA and allied forces continued to keep key roads and intersections leading to the besieged rebel-held areas under observation and fire. On November 6, 2016, the SAA and its allies launched counter-attack. By November 8, the Binyamin district, al-Hikmah school, and nearly all of Dahyat Al Assad were retaken, while by November 12 the SAA recovered all the territory it lost in the Aleppo area. The final phase of the Aleppo operation started on November 15, and by December 12, the militants’ defenses in East Aleppo have collapsed. On December 22, the SAA could finally claim complete control of Aleppo city following a militant evacuation from the city. While the liberation of the city of Aleppo was the greatest success of this period of the war. Furthermore, it had an important implication in both military and diplomatic fields. Jabhat al-Nusra and other militant groups have burned a large number of military equipment and manpower in failed attempts to break the Aleppo siege. They lost a major part of experienced infantry and spent a large amount of weapons, including anti-tank guided missiles and Grad-type rockets, during the battle for Aleppo. This predetermined their defensive posture during next months of the war. The temporary loss of Palmyra was the biggest setback of the Syrian-Iranian-Russian alliance. Taking advantage of the heavy commitment of the SAA and its allies on reducing the Aleppo pocket, ISIS launched an attack on the city of Palmyra on December 8, capturing it by December 11, with the high point of their advance being the attack on the T-4 airbase that began on December 22—not coincidentally, the same day that the complete liberation of the city of Aleppo permitted the SAA to reallocate resources toward other pressing operational problems. 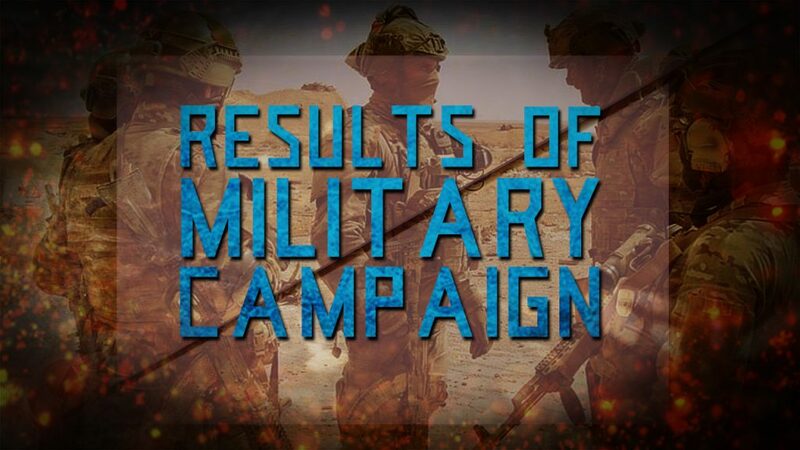 These newly freed up forces, as well as formations of the 5th Assault Corps (also known as the 5th Legion), with the help of the Russian Aerospace Forces, were able to repel the attack on T-4 and ultimately liberate Palmyra for the second time on March 1, 2017. In order to prevent the reoccurrence of the Palmyra disaster, the SAA continued to clear territory adjacent to the ancient city, capturing Al Shaer gas field in its northwest, and reaching Arak gas field in its east and Huwaysis village south of it. In order to step up pressure against ISIS and compel it to divert forces from other fronts, SAA and the Tiger Forces launched a large-scale military operation against ISIS in the eastern countryside of Aleppo on January 17. Another aim of the operation was to limit Turkish Army’s foray into Syrian territory as part of the Euphrates Shield operation, which led to Al-Bab from ISIS. The SAA continued its advance in eastern Aleppo countryside, where it captured the town of Tadif south of Al-Bab town on 26 February and reached SDF positions south of Manbij the following day after the jointly capturing several villages. On March 2, Syrian border guards deployed in 15 villages west of Manbij to separating Euphrates Shield forces from SDF. By May 24, the SAA succeeded in liberating over 90 villages in eastern Aleppo countryside, rapidly pushing to the ISIS-held town of Maskanah that remained the last terrorist group stronghold in the province. It liberation will open for the Tiger Force the way to the province of Raqqah and the central Syria from Aleppo and allow to secure the strategic Ithriyah-Aleppo road. Possibly sensing that the collapse of rebel forces in Aleppo meant that the SAA’s attention would soon turn to the Hama Province, Hayat Tahrir al-Sham, Jaish al-Izza and Ahrar al-Sham launched a new attack to reach the city of Hama on 21 March 2017, and managed to capture a large area, including the villages of Souran, Khatab, Rahba, Kawkab and Muardes within three days, before SAA reinforcements deprived the offensive of its momentum. Subsequent rebel attacks failed with heavy losses. 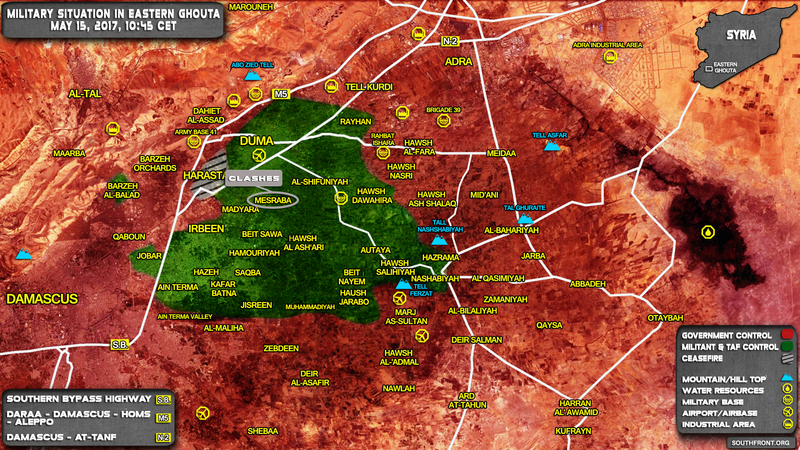 The March 21 SAA counterattack was able to retake Khattab. 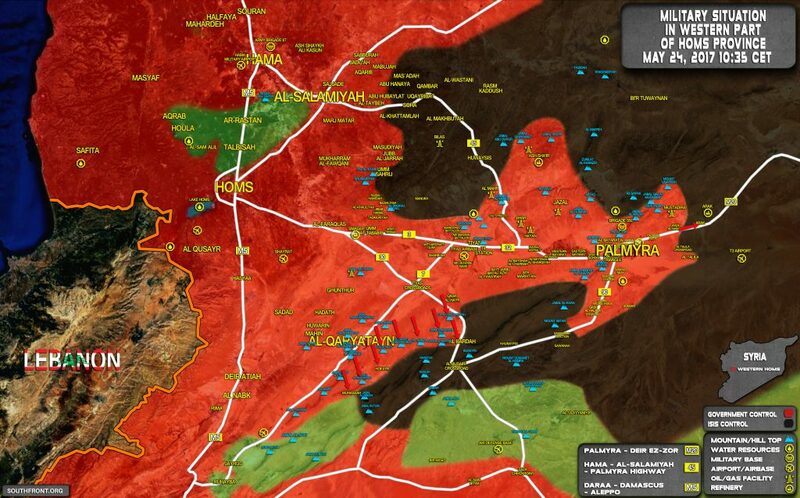 The SAA liberated Muardes on April 11 after prolonged fighting within the city, and continued on to Souran, Taibat al-Imam on April 17, Halfaya on April 22 before its own offensive lost momentum. Thus, government forces reversed all militant gains and even liberated additional areas. The SAA also fought two swift battles in the vicinity of Damascus that forced evacuation agreements in Khan Al-Shieh on November 30 and the Barada Valley north of Damascus on January 29. On May 13, the SAA took control of important areas of Qaboun and Tishreen in eastern Damascus because of a swift military operation and an evacuation agreement that followed it. During the same month, militants evacuated from the al-Waer neighborhood of Homs and the SAA got a full control over this city. This phase of the war brought to an end with the May 5, 2017, agreement on safe zones that encompasses Idlib, Daraa, Northern Homs countryside, Damascus, and Eastern Ghouta. The combined effect of the victories and safe-zones will likely be to finally enable the SAA to press eastward to lift the ISIS siege of Deir Ezzor. What has been dubbed by some pro-government sources as Operation Lavender will begin with the liberation of Al-Sukhnah 50km east of the city of Palmyra before proceeding toward Deir Ezzor. 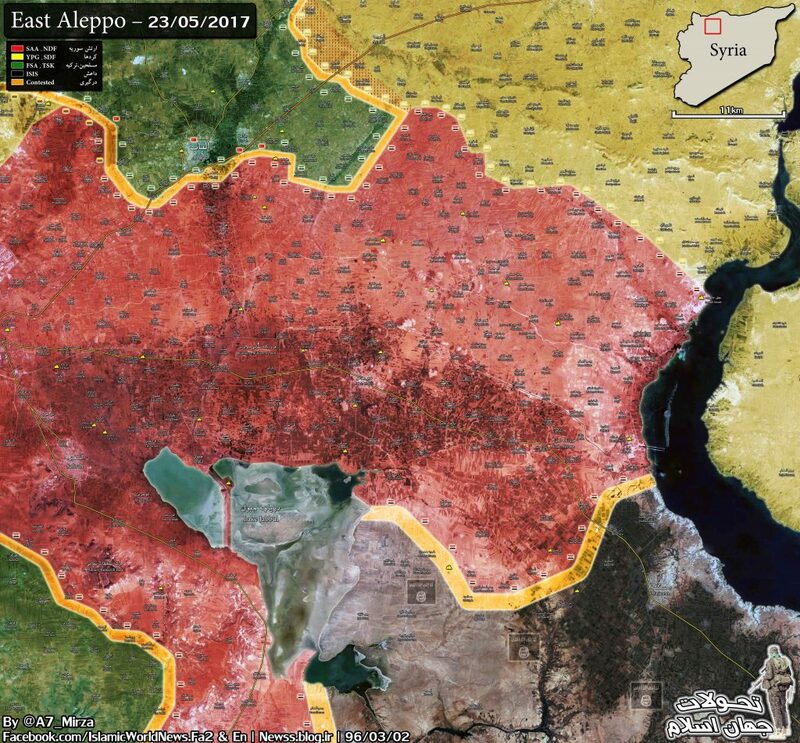 Thus in some ways the current military situation is vastly better than it was in October of last year, thanks to the liberation of Aleppo, the reduction of several rebel-held enclaves, and the heavy losses inflicted on ISIS on several fronts. The operations of the next six months will potentially have to contend with a factor that hitherto was absent, namely the growing presence of US-led coalition troops on Syrian territory. The US-led coalition has responded to the SAA victories with intensification of operations in southeastern Syria with a goal to build a buffer zone between Syrian government forces and the Iraqi Popular Mobilization Units that are rapidly growing to the most influential force in Iraq. The Syrian-Iranian-Russian alliance realized the thereat and intensified operations in the area. At the same time, the Syrian Democratic Forces with a large support of the US-led coalition’s airpower, artillery and special forces troops are preparing to storm the ISIS self-proclaimed capital of Raqqah. The competition for the Syrian-Iraqi border and for the oil-reach Deir Ezzor province has officially started. Shame of Russia when it does not defend Syria from USA, Turkey and Israel attacks, whatever be the reason. Doing so would distract from the overall goal of ending the fighting and removing the Moderate beheaders. is the point of saying “we are helping or protecting those nations” ? Israel wants to destroy no only Syria (work is already done by its terrorists) but Iran too, same or different way, and after those, my guess is that Russia is next. I do not see a strong determination of Russia to win this war because it is trying to make peace (dealing) somehow with the creator of the terrorists (USA-NATO-Israel)…….partition of Syria ? Indeed! I’m fully aware of that and at first felt the same way. Russia is fighting two wars: One of men and machines. One of media and public opinion. Decades ago, the Soviets didn’t find it as important to portray to the world what they we’re doing by strong media presence. Now, they’ve changed the whole playbook. The Russians learned a lot from the past and are applying it now. This is reminiscent of when the US had to get Israel not to retaliate against Iraq in 1991 when Saddam launched scud missiles at Israel in hopes of a retaliation from israel. This would’ve caused the other M.Eastern players in the “coalition” to back out and not allow coalition use of their airspace, airbases, etc. If Russia starts retaliating all willy-nilly this could make things harder for them later. It’s frustrating as all hell, but it has to be done this way so eventually the western backed beheader ‘coalition’ paints itself into a corner and can’t do anything. Shame on Russia? How about you and your country/nation? What did you do to defend Syria from USA, Turkey and Israel? You see? Blaming others is the easy part my friend. My country never has made an open and public declaration to defend Syria, Russia did. Yes, Gustavo. You country didn’t even try to help yet you have the nerve to blame Russia for not doing enough. Did Russia declare to ‘defend Syria’ or ‘assist Syria in it’s own defence’? I don’t remember any statement from Russia saying they were going to defend Syria at all costs but I do remember them saying they would assist Syria in it’s own defence with air power, intelligence, arms and training. The Russians have gone to great lengths to aid in Syria’s defence both militarily and diplomatically but putting Russian forces in a position where they are fighting the war on the ground with regular forces or fighting an air war with a small expeditionary force against the Israeli’s and USA was never part of the plan and something to be avoided at all costs unless we want to risk a high intensity world war that no one can win. Syria Iraq Russia Iran Alliance? That is a wonderful acronym for this theater of operations! I wonder…Did they do that on purpose? Its like the great race among the Allies during the near end of WW2. Dier Izzor seems to be the Berlin everyone wants now. But the SAA has most of the city. Whoever gets close will just help the SAA liberate all of the city. That’s a big question mark. Who is willing to help and who would rather take everything for themselves? Between the SAA / allies and PMU / Iraqi forces on one side, and SDF and FSA on the other, I’d trust the former if I were the Syria government.